For sixteen-year-old Charlotte Flynn, moving into the heart of the Michigan woods with her family is the biggest adventure she’s ever had. A self-proclaimed geek girl with a penchant for Sherlock Holmes, she wonders if she’ll ever have an exciting quest of her own. But when she discovers an antique carousel tucked into the woods near her new home, her life soon spins out of control. For the ponies are so much more than their faded paint portrays. Filled with primal magic, the ponies are alive, and they have been waiting for her for a long time. With the help of a young carousel caretaker named Black, Charlotte soon discovers that the Flying Ponies are in danger from others who want to possess them and their magic. Drawn into a battle for the carousel and ultimately the entire world while navigating her first true romance, Charlotte may have more adventure than she ever bargained for . . .
“This is a great read for young adult readers’. It’s a charming read told through the eyes of the modern geek-girl teen. There are references to all the favorites — Star Wars, Doctor Who, and Harry Potter — but Ransom does a fine job of relating to each of these without trying to be any of them. I found the book an exciting read, full of adventure, magic, love and fantasy! If you like C.S. Lewis, you’ll love this book. This is the first installment of The Flying Ponies Trilogy and I can’t wait for book 2! Available from www.kobo.com, www.amazon.com, www.amazon.ca, other fine book stores , School’s and Community Libraries. L. M. Ransom lives in West Michigan with her husband, son, and daughter. She also shares her home with two crazy Dachshunds, and her heart with two naughty ponies. L.M. is a librarian by trade, and an author by passion. She draws from her lifelong love and obsession with all things equine to spin tales about nefarious carousel horses. PSYCHIC: A person appearing or considered to have powers of telepathy or clairvoyance. Sixteen-year-old Elizabeth Wood is the sole survivor of a car crash that killed her parents when she was only six. 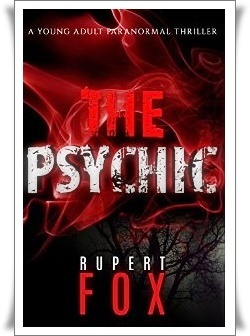 Haunted by her reoccurring dreams, she seeks the help of a psychic named Alex. Having discovered she has clairvoyant powers of her own, Elizabeth finds herself plunged deeper into the weird and mysterious world of the paranormal. When a young girl is kidnapped, Elizabeth experiences strange psychic visions, resulting in the police locating one of the kidnapper’s hideouts. But when a second girl is found dead, the police lose faith, leaving Elizabeth and Alex to hunt down the kidnapper on their own.